When I teach yoga I like to give freely of myself, to nurture my students and to help bring them closer to their true selves. That we are born to eternal life." My heart is filled with gratitude for the things I receive from teaching yoga. I bow to my students. I bow to the teacher in all things. I prostrate myself to the divine with the faith that I will find a way no matter what. Let yoga be your candle in the dark. Let it lift you and fill you. And create peace, love and harmony. At my last neuro appointment, he and I had a talk about how my MS is getting worse and how he and I believe my current therapy (then), Betaseron, just wasn't helping. I told him that I wanted to start Tysabri infusions and he agreed. Problem is, I have Medicare but no supplemental insurance. The Infusion Center figured that my co-pay would be $575 every four weeks. There is no way in hell that we can afford that kind of money, I don't care how good the drug works. I contacted TOUCH, and they put me in touch with NORD. I got paperwork from NORD yesterday, and we'll get it filled out and make copies of our financial records, hoping that they will cover my co-pay. If I do get to go on Tysabri infusions, it will be wonderful. I honestly believe that this drug can help me. If I don't, I'm not going to get depressed or sad. I will just continue on with my life, deteriorating toward who knows what. I will be DMD-free, anyway. In other news, I was invited to join a book club--my first ever. Our first book was Travels With Charlie by John Steinbeck. Loved it. We meet every other month at a nice little restaurant that is closed for lunch during the summer, except for the book club. We have great food, good discussions, and lots of laughter. 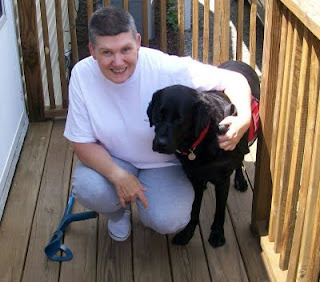 Three of the women in the club (including me) have Saint Francis service dogs. The woman who started the club is also the woman who co-founded Saint Francis. There are 10 of us, and everyone is nice and friendly. Our next book (just started reading it today) is The Good Earth by Pearl Buck. Think I may have read it in high school, 40+ years ago!! I have also volunteered and been accepted to be on the Outreach/Screening Committee for Saint Francis. Eventually, I will be calling people who have applied for a service dog, asking them questions and talking to them about the responsibilities and hard work that goes into training with your dog. I will sit in on interviews of people who have passed the screening, and I'll have imput into whether or not I believe they would be a good candidate for a dog. These two things are giving me something to do outside of the house, and also giving me a sense of accomplishment. Next Saturday is my 40th high school reunion. I am very excited about it. This is the first one I've ever attended. There are a group of us who have kept in touch through the years who are all going to sit at the same table. Next morning, this same group is meeting for lunch and talk. There are so far 45 graduates (plus spouses) who have signed up to come. My class had about 125 people in it, so that's not a bad turnout. This week I received the annual note from Carefirst BCBS, my insurance company, informing me what my new health insurance premium rate will be for the upcoming 12 months. Of course, I expected that it would go up, no matter how I wished it wouldn't. In 2003, it was 22.2%. In 2004, 18.2%. In 2007, 19.9%. In 2008, 18.8%. But COME ON. Enough is enough. another 31%? For insurance which doesn't pay for my MS medications, I will be paying $5172? That's just for me, no one else, and is not subsidized by any employer since I am self-employed. And unlike most folks who have employer-sponsored health insurance, I will be paying Social Security, FICA, etc taxes on that $5172. Why doesn't Carefirst cover my main MS medication, Copaxone? Because the drug benefit for individual policies is capped at $1500 annually. How do I get Copaxone if insurance doesn't cover it? I have to qualify for assistance from NORD which administers the PAP. I must earn less than 200% Federal Poverty Level (FPL) and can't have significant amounts of money in savings. How much is 200% FPL? This year (2009), it is an Adjusted Gross Income (AGI) of $21,660. For more on this story, see The Value of Money or Value of Health: What Do You See? Since I'm self-employed, I get to deduct the amount spent on health insurance premiums before income taxes are calculated. So it's a minimum of 19.3%, after Social Security/FICA tax is accounted for and before the AGI is calculated. But, please tell me. Who can afford to spend 19-24% of the highest level of income they can afford (or are allowed) to earn for health insurance premiums? And let's just say that for 2008 I did earn considerably less than 200%. In fact, $5172 really would be closer to, if not more than, 25% of total income. According to proposed health care reform legislation, affordable premium rates for someone with my income level would be closer to 5% of income AND I would very likely have coverage for my medical needs, including pharmaceuticals. A few weeks ago, I sat down and calculated what medical expenses were included during one year in obtaining the routine care I require. That detail can be read at Living with Multiple Sclerosis: The Cost of Chronic Illness. Update: Now it looks like the Public Option just might get dropped during negotiations in Congress. sigh. This concludes the 43rd edition of the Carnival. The next Carnival of MS Bloggers will be hosted here on September 10, 2009. Please remember to submit a post (via email) from your blog of which you are particularly proud, or which you simply want to share, by noon on Tuesday, September 8, 2009. -I love doing volunteer work myself. Makes me feel connected to outside people. 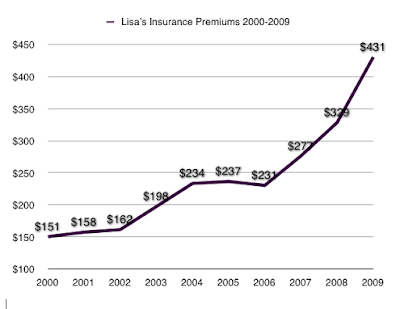 -Our insurance is increasing about 25% in Sept. UGH. It is all so crazy, Lisa. Artists, the self-employed, this is the American dream---HA! To prevent an artist from making art is to chip away at our souls. Why isn't Montel Williams doing PSAs about HC Reform? (oops, sorry, off topic, my bad) We are expected to sacrifice all "extras" to pay for ins., my oh my, isn't life fun? Having a chronic illness just wasn't fun enough, now we must give up a movie out, a pizza in, a higher count sheet, new shoes. The Salvation Army is the place we must shop and be happy about it. I had MS AND Cancer (2 surgeries over $30,000 in 1995) and a few months ago a virus cost me $60,000 for 5 days in the ICU. (subtracting rides at $600 a pop both ways.) I had ins. then through the state, now I am a Medicare Dunkin Donut Hole Loser. Excuse me, I'm off to see the Wizard.